Home Arts	Where Life Imitated Art, and Art Imitated Life. He was an international art star the status of Andy Warhol. But a fateful trip to Captiva Island more than 50 years ago led him to escape the spotlight of New York City for the butterflies and turtles of Captiva — changing his life, and the life of our islands, forever. For those of you who’ve driven it, Laika Lane is the last left turn off of Captiva Drive before the narrow, two-lane road curls west and empties you into South Seas Island Resort. Although a sign at the entrance to Laika Lane suggests it’s for residents only, the fact is that anyone can enter and take the shell-packed road all the way to its end — where you’ll come upon the public egress to the beach here on the Gulf of Mexico, and you’ll need to summarily turn around and exit, unless you’re living or renting a vacation home on the street. As you turn your car around, however, pay close attention to that large, white, square monolithic structure to your left. Because there, in a stunning home on a spectacular beach with a breathtaking view of day’s end 365 days a year, was the home of Robert Rauschenberg. To say that Bob Rauschenberg was a rock star of the pop art world that came to life in the fifties and sixties — and one of the most influential American artists of the past 100 years — is an understatement. Rauschenberg was, and remains nine years after his death at the age of 82, an artist whose influence on the evolution of art, and the development of future artists pushing the boundaries of their media, cannot be understated. It was the late 1950s when Rauschenberg, a regular visitor to St. Petersburg, began exploring destinations further south and happened upon the islands of Sanibel and Captiva. According to legend, as he traversed the islands, he had to stop for a turtle in the road (which he reportedly loved) and upon viewing some property on Captiva, was surrounded by butterflies. In this artist’s mind, it was a revelation; he began purchasing property on Captiva (eventually 20-plus acres, most still protected by the Robert Rauschenberg Foundation) to maintain the island’s natural state as best he could, and made the permanent move from New York in 1970. Working out of a small beachfront studio on Laika Lane, protégé and partner Darryl Pottorf one day noted to Rauschenberg that if he wanted a beachfront home that was truly a place to live and not just a place to work, he’d better build it fast before zoning regulations would change, moving his property hundreds of feet further from the beach. The result of that suggestion is Rauschenberg’s incredible three-story home on the beach at the north end of Captiva Island. Designed by Pottorf to satisfy Rauschenberg’s loves of life — cooking, entertaining, hosting and creating — the home stands today as a few-of-a-kind-in-the-world: a place where life imitated art, and art imitated life, in a brilliantly minimalistic masterpiece of architecture, art and lifestyle. 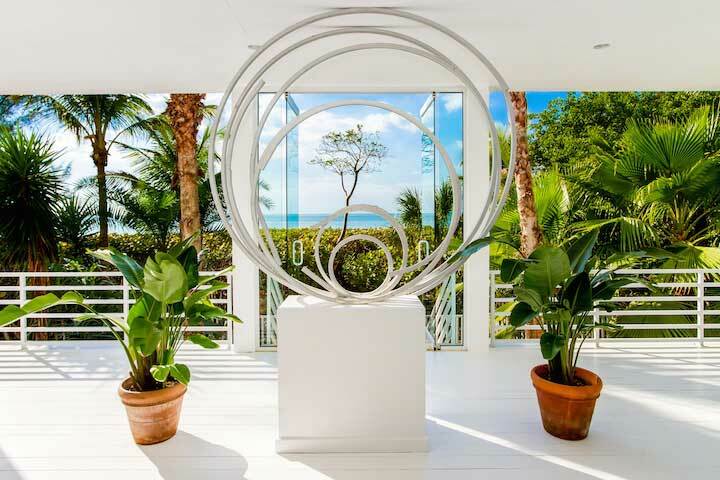 In the end, Bob Rauschenberg is no different than any other of the thousands of residents and visitors who’ve fallen in love with our islands, and wanted to make them home for the rest of their lives. 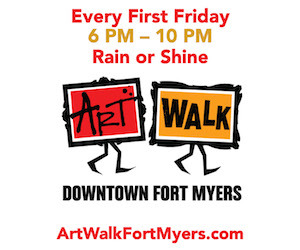 In the end, this world-acclaimed artist embraced the vibe of Southwest Florida like the rest of us who love life a little slower, a little more casual and with sand between our toes. 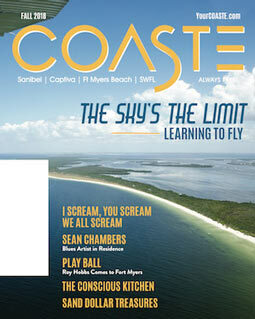 This issue, COASTE departs from our traditional Artist in Residence feature to give you an exclusive, behind the scenes look at a world-renowned artist and his world-class residence on Captiva — now available for purchase via Karen Bell and the Bell Team for $6,995,000.